Is your brain talking to you? Just take a moment and scan this communication list…. I have a permanent headache…. I feel so fragile all the time..
(If you didn’t tick off anything on this list then I can only say well done, you either have fantastic coping strategies in place, a support system which is second to none, are in therapy regularly or have had a peaceful year or a combination of all the above along with an incredible sell-awareness and intervention programme when things get too much). The human brain has long been considered programmed for survival. As such it’s primary instinct is to keep you alive. However unfortunately for us, our limbic system (the part that regulates emotions and all the fun stuff) is sitting trying to process all of the chaos around us and sometimes it just doesn’t file things away… especially when we don’t give it a hand! This often happens in difficult times and situations where we have little or no prior experience e.g. trauma, bereavement, difficult circumstances, bullying, conflict, abuse, domestic violence, child illness, birth trauma. And this is where stress is created… A filing cabinet with too much overdue filing… = the symptoms of stress. Remember those symptoms at the start of this article? 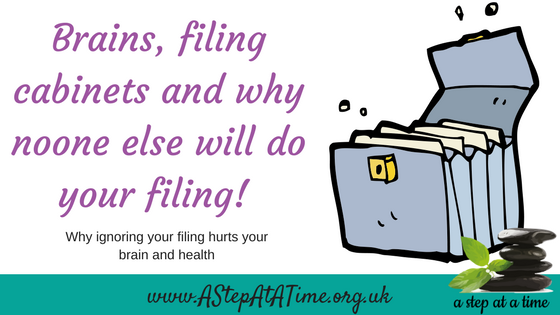 Warning signs that your filing tray is overflowing! So the morale of this story? Is your in-tray overflowing? Are you ignoring the papers falling on the floor? Next steps? Find a therapist who focusses on reprogramming responses or developing suspension files so that you can put away the paper in the in-tray and return to peace a quiet. The best fairytale we could ever yeah our children. teenagers and friends – we can’t expect the filing to be done for us! If you would love to clear your filing in-tray before the year is out and enjoy some peace of mind and less stress then get in touch and we can get your filing done and you can start a new year with an empty in-tray!